Employment law changes... from all 50 states, at a glance... Impossible? Not any more! 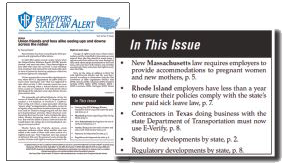 Each month, the Alert's researchers uncover and summarize the latest state employment laws and regulations emerging from the 50 state capitols. How does Employers State Law Alert help me with my HR needs? Start your risk-free subscription to Employers State Law Alert and stop worrying! 2018 Digital Versions are available; Access anywhere! GUARANTEE: Your 100% satisfacation is guaranteed. If for any reason you are not completely satisfied with Employers State Law Alert, simply let us know within 90 days, and we will issue you a complete refund.